I break for the Cheesecake Factory. When I see one I jump for joy and whine til I get to go. Good thing I dont see one very often. I think the closest one is an hour drive to Beechwood. I usually only go when in Columbus. I always get the same thing. Im sure they have a fabulous menu, but my brain focuses on the Louisiana Chicken pasta and it doesnt seem to look elsewhere. Of course I usually get a different cheesecake so I do shake some things up a bit. *Note* I cut my chicken up so it's easier to eat with bites of pasta. The original recipe calls for you to pound it flat, dredge with milk, the into dry mixture. If you want it authentic try it this way. 2. Melt butter in a large skillet. 3. Add peppers, mushrooms and onions. Saute 4-5 minutes. 7. Stir in basil and parmesan cheese. 9. Toss pasta with sauce. 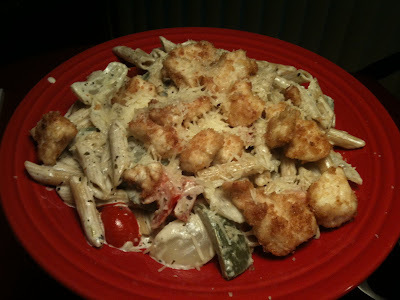 Plate pasta, top with cooked chicken and sprinkle with parmesan cheese. I am going to make this - it looks so good. Thanks for sharing. this blog's post to be updated regularly. It carries pleasant material. This printer doesn't have a current select change. It is offered as a 110 volt version or a 220 volt version. To convert the printer from one variation to the various other, you would certainly need to switch out both the power supply and the fuser. A minimum of it just didn't power up. gone bang and/or tripped out the whole office. insert the afflicted section to note pad, tidy up the text you prefer preserved, then content and insert it back. could readjust frames and tabs to place it much better for on your own. writing? I've a presentation subsequent week, and I'm on the search for such information. Sir, really v usefull the website send me theVideo thangs. how can i do this on a mac.